NATHALIE ROZOT/ SOLAR POWERS OF 10 "Solar Powers of 10" (SP10) is a solar-powered light sculpture proposed in homage to Charles and Ray Eames’ s short documentary film “Powers of Ten.” It is designed to increase public awareness for solar energy by exhaling a nocturnal ghost image of a Sun. SP10 is a versatile light-art installation, which can be temporary or permanent and presented in various sizes as land-art or as a billboard. NATHALIE ROZOT/ SOLAR POWERS OF 10. 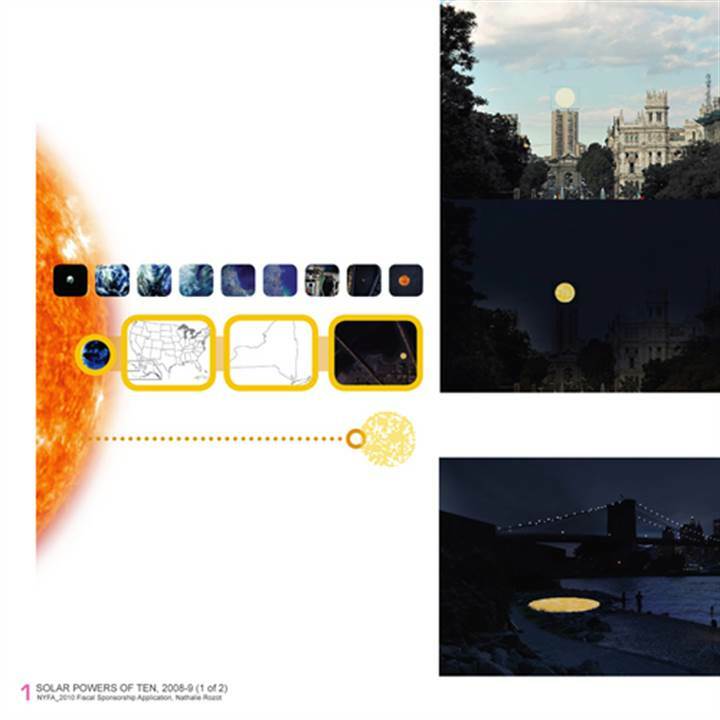 A light-art installation, “Solar Powers of 10” is conceived as a solar-powered nocturnal sun that glows between dusk and dawn, and resonates in the night as a double metaphor. It echoes both the twentieth century conquest of scale and the parallel between the energy concerns of the 1970s and today’s global quests for post-fossil fuel sustainable energy solutions. Moreover, SP10 calls for a paradigm shift in today’s nightscapes. Even though solar power is a valid alternative energy resource, stand-alone solar lighting applications remain scarce. SP10 serves as an invitation for solar-powered urban scapes. SP10 is versatile: it can be implemented as a temporary or permanent land-art installation or billboard display. The proposed size of the sculpture can also vary in diameter. The scales of perception of the installation will vary: it will be seen locally by residents and visitors, by landing and departing plane passengers, from satellites (anthropogenic or astronomical), and possibly in virtual worlds. The sculpture comprises an array of solar-powered “pixels” of monochromatic light (white and amber), which will charge during the day and reproduce a mirror image of the Sun after hours. The light pixels are off-the-shelf light pavers. These are safe, durable, and do not require maintenance. For a temporary installation, the unit markers can be secured onto a plain mounting frame, which can be anchored to the ground or to a billboard and dismantled at the end of the exhibit. If SP10 were to be produced as a one-time intervention, the ground-mounted units could be let loose on the mounting platform, and therefore be likely to be taken away by passers- by. The sculpture would thus disintegrate as a silent manifesto-- the underlying message is that solar energy is free, and should be harnessed by all.